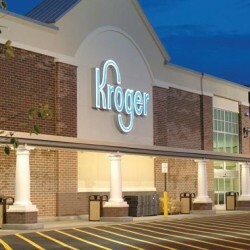 The Kroger Co. (NYSE:KR) is one of the world’s largest grocery retailers, with fiscal 2014 sales of $108.5 billion. The Kroger Co. Family of Stores spans many states with store formats that include grocery and multi-department stores, discount, convenience stores and jewelry stores. the company operates under nearly two dozen banners, all of which share the same belief in building strong local ties and brand loyalty with our customers. One of the world’s largest retailers, Kroger employs nearly 400,000 associates who serve customers in 2,625 supermarkets and multi-department stores in 34 states and the District of Columbia under two dozen local banner names including Kroger, City Market, Dillons, Food 4 Less, Fred Meyer, Fry’s, Harris Teeter, Jay C, King Soopers, QFC, Ralphs and Smith’s. The company also operates 782 convenience stores, 326 fine jewelry stores, 1,330 supermarket fuel centers and 37 food processing plants in the U.S. Recognized by Forbes as the most generous company in America, Kroger supports hunger relief, breast cancer awareness, the military and their families, and more than 30,000 schools and community organizations. Kroger contributes food and funds equal to 200 million meals a year through more than 80 Feeding America food bank partners. A leader in supplier diversity, Kroger is a proud member of the Billion Dollar Roundtable and the U.S. Hispanic Chamber’s Million Dollar Club.